What I fear most is happening, my workload at the office is more than I wish at this time of year. I am finding difficulties to keep my promise. 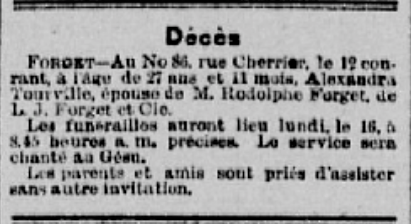 I found this funeral notice (in French) in La Minerve newspaper from Montreal dated Saturday, February 17, 1894 for Célina St-Jean, wife of Louis Tourville, legislative counsel in Quebec at the time of his wife’s death. She died on February 12 and the funeral took place on Friday, February 16, one day before the newspaper was published. We do not have legislative counsel anymore in Quebec. For those familiar with Canadian politics, this function was the equivalent of senator on the federal scene. This list is quite impressive, with all people that count in that time period on Québec, federal or municipal political scenes. If you have French-Canadian ancestors and feel a little bit adventurous, you might try to dive in and look in La Minerve which covers the years 1826-1899. While it is not indexed, if you have a date, you might try to take a look. Also, this link will lead you to a searchable newspaper database (in French). You might try it, you never know. If you need help with the interface, do not hesitate to contact me, I will be glad to help.